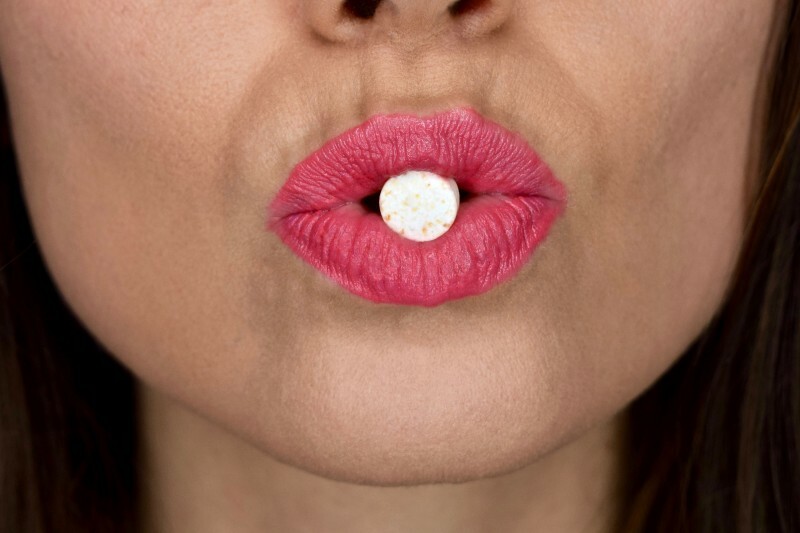 You may have tried lots of products to freshen your breath – from mints, to gum, to mouthwash, but now, I’ve discovered oral probiotics, and they are a game-changer. Since August, I’ve been using Hyperbiotics PRO-Dental probiotic. It is a chewable pill you let dissolve in your mouth after brushing and flossing, which is designed to promote a healthy oral microbiome, and therefore, healthy teeth and gums, and even ears, nose, throat, and sinuses. Bye Morning Breath: First, did you know, you don’t have to have “morning breath”? Morning breath is typically the result of bad bacteria proliferating overnight, and most conventional dental products, like mouthwash, aim to kill the bad bacteria to stop the stench, and replace it with the scent of alcohol and artificial mint, which eventually wears off. (PS – they kill the good bacteria, too). But, if you have all your stinky bacteria in check thanks to non-stinky good bacteria, you can wake up with breath that doesn’t stank. That’s what the Hyperbiotics PRO-Dental probiotics do. They contain two strains of the probiotic S. salivarius, which is deficient in those who suffer from bad breath. The K12 strain of it effectively crowds out odor-causing bacteria before they have a chance to knock some one out. Clean Your Teeth Better for a Whiter Smile: In biology class you may have learned about biofilms- slimy bacteria colonies that form in watery environments…including your mouth. You probably are familiar with the more common term: plaque. The yellowish plaque that forms on your teeth is a biofilm that causes tooth decay and gum disease. Hyperbiotics PRO-Dental tablets contains the probiotic S. salivarius M18, which produces an enzyme that helps dissolve and loosen the formation of biofilm. The strains M18 & K12 crowd out and reduce the amount of undesirable bacteria. That means less plaque and a whiter smile. Improve Gum Health: Because the plaque that yellows your teeth also clogs up your gums, those same strains that support healthy teeth mentioned above, also support healthy gums by reducing undesirable bacteria. Healthy gums are crucial to overall health, as gum disease, if left long enough, can actually lead to other more serious infections in other parts of your body. 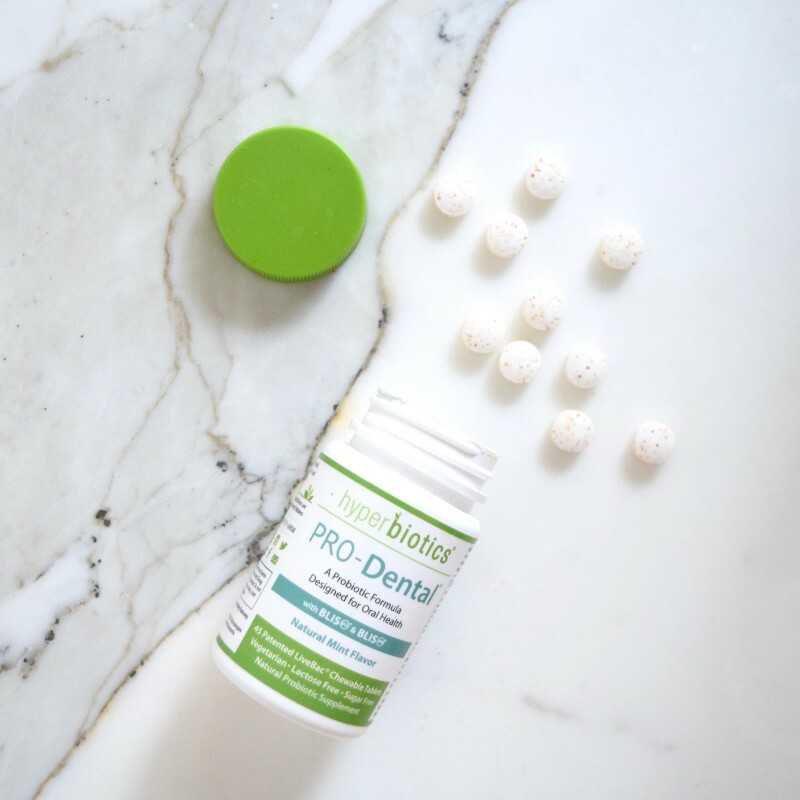 When I started using the Hyperbiotics PRO-Dental, a chewable oral probiotic, I noticed immediately the next morning, my mouth feeling so fresh and clean, that I didn’t have any coating on my tongue, as I sometimes do. It’s common to sometimes wake up with a thin white coating on your tongue, which is made of a mix of bacteria, debris, and dead cells that accumulate overnight. Typically, I use a tongue scraper to remove it, which is an ayurvedic practice. After starting the dental probiotics, white morning gunk is gone. My breath is fresher. And overall, my mouth just feels cleaner. They are so simple to take, and I now keep them in my toiletry bag along with my probiotic naturally whitening toothpaste, so I can keep them with me when I travel. My mouth has never felt better! If you’d like to try it for yourself, the amazing team at Hyperbiotics has so generously offered 20% off to my readers! Go here to order and use the Hyperbiotics discount code HYPERMARIA to get 20% percent off your entire first order. Disclosure: Although this post is sponsored, all opinions are my own. I initially discovered and purchased Hyperbiotics on my own, and because I found them so effective, reached out to the company to offer a discount code for my readers. If you use the discount code on hyperbiotics.com, I will receive compensation.